Fixed-mounted thermal imaging cameras like the FLIR A310 can be installed almost anywhere to monitor your critical equipment and other valuable assets. It will safeguard your plant and measure temperature differences to assess the criticality of a given situation. This allows you to see problems before they become costly failures, preventing downtime and enhancing worker safety. Both thermal imaging cameras contain an uncooled Vanadium Oxide (VOx) microbolometer detector. They produce crisp thermal images of 320 x 240 pixel and detects temperature differences as small as 50 mK. They come with a built-in 25° lens with motorized focus. Other fields of view are available. Stream MPEG-4 video over Ethernet to show live images on a PC. 640x480 with overlay up to 30 Hz. Ethernet-enabled, communication and power can be supplied with only one cable. Composite video outputs, PAL and NTSC compatible are available. Both cameras can be controlled remotely over the Web using TCP/IP protocol. Since FLIR A310 is Ethernet/IP and Modbus TCP compliant analysis and alarm results can easily be shared to a PLC. Digital inputs/outputs are available for alarms and control of external equipment. An image masking function allows you to select only the relevant part of the image for your analysis. FLIR A310 comes standard with built-in analysis functions like spot, area measurement and difference temperature. Alarms can be set to go off as a function of analysis, internal temperature or digital input. The camera automatically sends analysis results, IR images and more as an e-mail on schedule or at alarm. Autonomous dispatch of files or e-mails, acting as an FTP- or SMTP-client is possible. 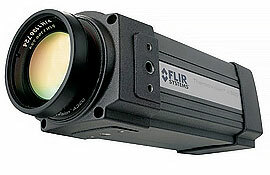 The FLIR A310 can be ordered already built into an environmental housing. The housing increases the environmental specifications of the FLIR A310 to IP66, without affecting any of the camera’s features. It is ideal when the camera needs to be installed in dusty or wet environments. The housing is available for A300 cameras that are equipped with 7, 15, 25, 45 or 90° FOV lenses. Users that want to build the camera within the housing themselves or that already have a FLIR A310 that needs extra protection against dust and water can order the housing separately as an accessory.